The Platinum Club at Guitar Center’s new flagship Times Square store. 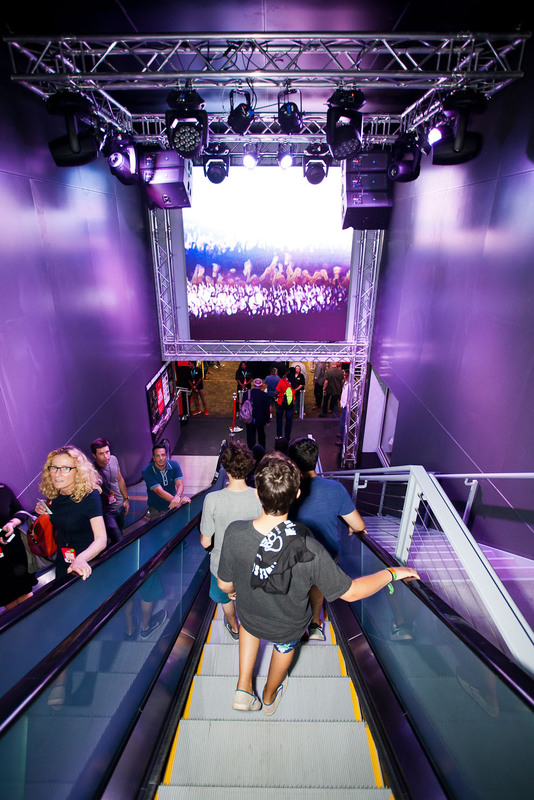 The escalator leading visitors into Guitar Center’s new flagship Times Square store. WESTLAKE VILLAGE, CA, September 15, 2014 — Guitar Center recently opened the doors on its new flagship location in New York City’s Times Square with a star-studded opening weekend and a level of spectacle right at home in what is arguably Manhattan’s busiest and most conspicuous district. 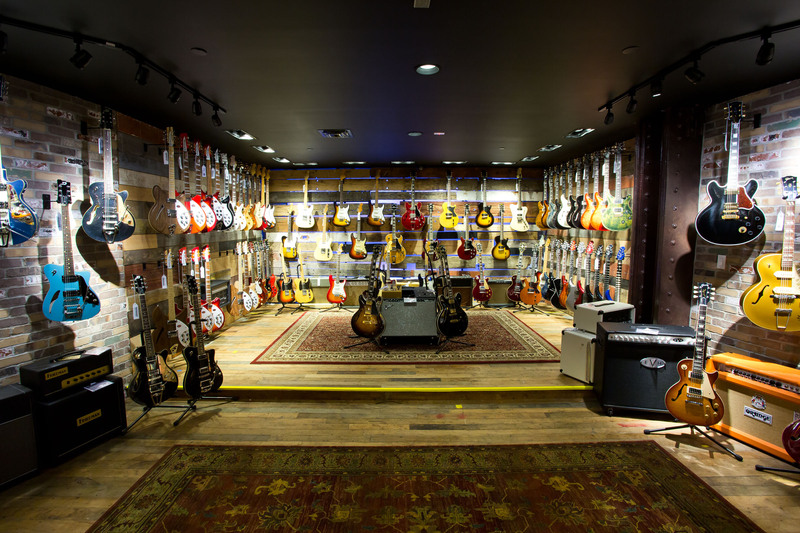 Guitar Center’s 262nd retail location is an ultra-modern musical instrument and technology center covering over 28,000 square feet. In-store elements include Guitar Center’s Platinum Club (showcasing high-end luxury guitars, along with a live performance venue and control room); a Fender custom shop where unique guitars are featured; a full DJ experience department; a boutique pedal selection in a stunning 360-degree display; and 28,000 square feet of guitars, drums, keys, DJ, recording, live sound and more. The store also now serves as the permanent home to two legendary pieces of rock history: Eric Clapton’s iconic “Blackie” Fender Stratocaster and ES-335. For the complicated task of helping design, manage and install the A/V components to meet the needs of such a technology-specific space, Guitar Center sought an organization with the right expertise to get the job done, on budget and on time – luckily, they had one in-house: Guitar Center Professional (GC Pro), the outside sales division of Guitar Center that focuses on the needs of professional users. Throughout the project, GC Pro worked with Affiliate Program member Horacio Malvicino and his firm Malvicino Design Group, who designed and installed the detailed A/V setup. A multi-screen Panasonic video display graces the outside of the building on 44th St., composed of screens sourced through GC Pro. Upon entering, visitors begin to descend an escalator, immersed in the sights and sounds of an excited crowd waiting for their star to take the stage. A complement of QSC speakers and a Q-Sys system, along with a massive LED display screen, helped create this effect. “It’s as if you’re a rock star coming into a stadium to perform, and so we were asked to help create that experience,” stated Plushner. Photo Caption 1: The Platinum Club at Guitar Center’s new flagship Times Square store. Photo Caption 2: The escalator leading visitors into Guitar Center’s new flagship Times Square store. 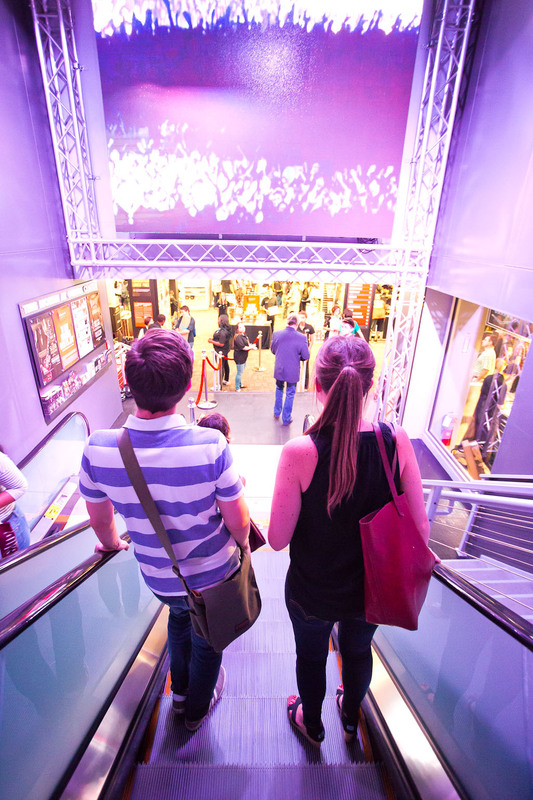 Photo Caption 3: The escalator leading visitors into Guitar Center’s new flagship Times Square store.